...start another blog, or two, or move to twitter. Facebook? Never. Last week I spent a few days in DC. Technically we moved away a couple of years ago, but my heart is still there, and so is my body with fair regularity. And though I'm slowly developing new routines in my new city, there are a few things that just don't transfer easily: 1) haircuts, 2) chamber music groups, and 3)Nordstroms. So last week I got my hair cut and spent a very productive day at Nordstrom outfitting myself for my trip to Scotland next week. (Retirement + knee surgery + perimenopause = all my clothes have shrunk. Go figure.) But the best part was the play dates. The first evening I met with two good friends and cello-playing buddies, three cellos, and five bows. Friend 1 had two on trial, a Richard Grunke ~ 40yo and a hot-off-the-bench Sam Cohen. After doing round robins playing the bows on his cellos we read the Beethoven cello trio (originally for horns) in order to compare them in an ensemble and had quite the good time. The next evening I joined Friend 1 in "my" old quartet, where he replaced me after I moved. Since we had a cello-heavy quintet, they agreeably scrapped their plan to start working on Death and the Maiden and played the Schubert string quintet instead. We played the outer movements, with me on Cello 1. Expectations were not high since no one had prepared, and we had a terrific time meeting them, and got in a little more bow comparison, too. Friends who will let you massacre the first cello part in the Schubert are very special. The last night of playing was Schubert again, this time a planned outing that I had organized because my last teacher (T2-) had expressed a hankering to play the first cello part with a congenial group of amateurs. My string trio formed the core, then we added T2- on Cello 1 and my favorite first violinist, someone with whom I had played piano trios in a university chamber music course for a couple of years. I had mailed parts to the upper strings, so they had had a few days to look at the music, not much time because they were completely unfamiliar with it. It's cello Top 40, but amateur quartets don't often have that fifth cellist available so it's not as well known amongst the non-cellists. It was absolutely the best rendition of this piece I've ever played in, and we read all four movements. The second movement seems to give amateur groups the most difficulty. Though slow, the key signatures are eb minor (5 flats) and E Maj (4 sharps), cello 1 is mostly thumb position, playing a duet with Vn1 much of the time and demanding a beautiful legato technique, and the cello 2 part has sixteenth note triplets followed by runs of accidental-studded 32nd notes as the music becomes more agitated. I first played this last summer and completely bombed the cello 2 part, but we won't talk about that now. This performance was much more respectable, aided by some audible counting from T2-. A little more work on the 32nd notes and I think I'll have it. There was one particular moment in the middle of the Adagio, where the melody descends an augmented 2nd to move to the tonic, that was truly electric. We made a couple of extra passes to perfect it, and I got chills each time. Wow. That night I woke up every couple of hours and lay in bed, not trying to return to sleep, but replaying that quintet in my mind. It's fading now, but then I heard *us* playing it, and not a more generic rendition. Sublime. It's been a bit anticlimactic since then, just a series of small parties celebrating my "big five-oh." That's today. HBtM! Happy Birthday to you! Sounds like you had a great time in DC, playing a lot of great music. What better way to celebrate the event! I lived in DC for seven years (in my pre-cello years) and understand the attachment. I enjoyed this post! Happy Birthday! Congrats on the anniversary of your birth. Wishing you many more years of music making! Happy Birthday! What a wonderful way to spend a weekend - good music, good friends - it doesn't get much better than that! (Hopefully good food too!!!!) I love the Schubert quintet - loved your description of playing through all of the movements! Happy Birthday! What a milestone for you. 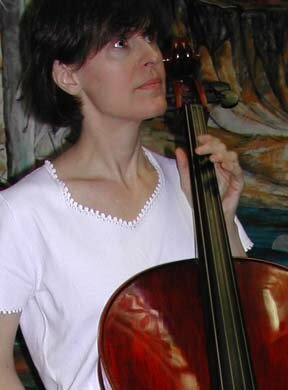 I guess playing cello must keep a person young, because I wouldn't have guessed you were 50. Thank you everyone, for your good wishes. As I was playing in that quintet, with ages of members ranging from under 30 to over 70, I was again reminded that for musicians, while age may not be meaningless it is really not a very useful concept. Keep coming back? Let me know!